Free Pattern :: Knit Cord Coaster- Kid Craft! Knit 5 feet of i-cord following the spool knitter directions.Cut a long tail when binding off or start a new yarn. 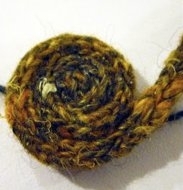 To get started with the spiral, begin by curling and stitching together one end. 2. Continue spiraling and stitching. 3. If you run of yarn to use for stitching, no problem. Simply tie on more, pull the knot tight and sew in the tails. 4. Continue spiraling and stitching the cord until you have none left. Add a few extra stitches to secure the end of the i-cord to the body of the spiral. Sew in the tail.